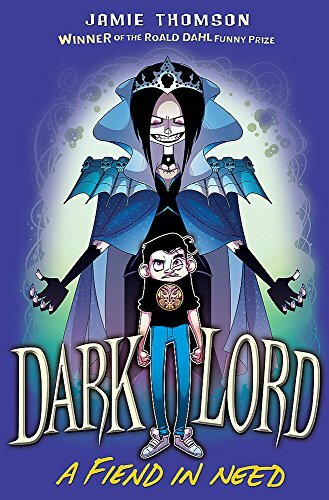 Sequel to Dark Lord: The Teenage Years, this fish-out-of-water adventure continues with the Dark Lord trapped on Earth in the body of a thirteen-year-old boy. The Dark Lord (or Dirk Lloyd as people on Earth mishear it) of The Darklands realm must find a way out of his human shell and return to his own world – not only to get back his evil powers and dictatorship, but also to rescue his friend (if he dare admit he has one) Sooze, who was transported to The Darklands at the end of the last book. He’s also got to survive the assassination attempts of a creepy witch from his homeland disguised as his nanny on Earth. In the The Darklands, goth-girl Sooze finds that life as a Dark Queen might actually quite suit her, but she baffles and impresses the usually under-trodden minions with alien notions of equality and affection. They might even prefer her as a ruler… if she can survive an attack by the White Wizard, who is sworn to destroy all that he claims is evil. Lots of fun is had playing with the conventions of the fantasy genre – especially in encouraging readers to think harder about the usual stereotypes. Just how ‘good’ is a White Wizard who rules so harshly? Why is it acceptable for knights to slaughter goblins and orcs on principle? And if a Dark Lord is truly evil, can he ever really change? Enjoyable and very inventive, if spread a little thinly at times across its 400+ pages, this novel will have you mwa-ha-ha-ing at Dirk’s antics in no time.